This week the City Council made the right decisions for Encinitas and the proposed Rail Trail. After a detailed presentation from staff and input from more than 30 residents at Wednesday night’s special meeting, we agreed to put SANDAG’s paved bike path along Highway 101 instead of inside the natural environment of the rail corridor. Put simply, we need to improve all of the discussed areas — San Elijo/Vulcan Ave., the dirt path in the rail corridor, and the Highway 101 walking and bike paths. The question is how to make these changes with sensitivity to the natural environment, with the involvement of the community and with the perspective of having a continuous plan for bikes and pedestrians so we don’t do piecemeal development. The plan we rejected for the rail corridor is shown in the animation above, with its natural state contrasted with the proposed path. It’s too much concrete for that natural, coastal habitat and we don’t have the ability to change the plan to make it fit the sensibilities of the community. Additionally, the fence hugging the trail that blocks people from crossing the tracks to the beach was a major problem, especially given that we don’t have a clear path to a quiet, legal crossing at Montgomery yet. 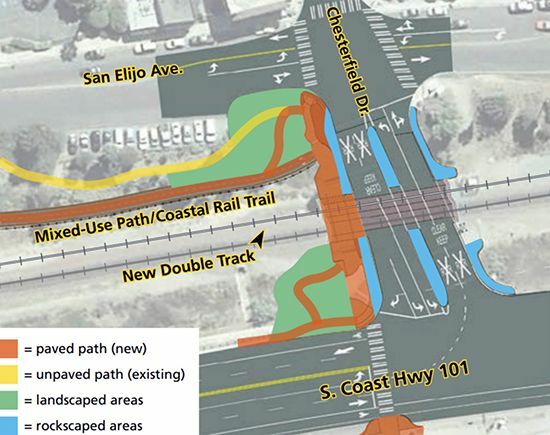 This is the proposed improvement for Coast Highway 101 from Chesterfield to about Swami’s. We voted to support SANDAG moving their planned 44-mile regional bike and pedestrian facility to Highway 101 in Cardiff and out of the rail corridor itself. Headed north from Solana Beach, people using the rail trail will ride along Coast Highway 101 (a very dangerous section that won’t be improved for many years), and from there bikers will continue straight north through Cardiff on Highway 101. Importantly, Highway 101 is already paved concrete, and improving the well-loved and highly used biking and walking infrastructure that is already there doesn’t degrade or destroy open space. That location also doesn’t trigger the need to build a fence along the railroad track. Our decision this week had to do with the city’s direction related to SANDAG’s rail trail plan, but the city still needs to improve San Elijo Ave., particulary the northern, narrow section to make it more bicycle- and pedestrian-friendly. And in the rail corridor itself, many people, including me, would like to see an improved dirt trail system, like you might find in Torrey Pines State Park or the San Elijo Lagoon — a continuous walking path, but not a concrete highway. Above is the proposed plan for the Chesterfield Dr. interchange. It’s critically important that we have the right engagement approach for regional projects like this, so projects reflect the unique character of Encinitas. I’m grateful the Mayor was willing to include creating a local Working Group in her motion. There are lots of local preferences that affect design, aesthetics and functionality. It’s like a homeowner building a house — an architect doesn’t take a general concept from the client and then start construction. There is a close, ongoing, back-and-forth relationship about ideas that work or could be improved. Some may think that the city’s government alone can interface with regional agencies, but input from people who use the facilities and live in the community is essential. With this type of involvement, the outcome of the project will not only be more acceptable to the community, but it will be a better project. Thank you to all the speakers who spent their evening telling us what they value — preservation of open space; easy beach access; better biking and walking options; paths that connect people with places; and safety for all. I feel satisfied with our decision and grateful for the successful outcome for our city and its residents. As always, though, there is more work to do.